It’s not a coincidence that the poetry and quotes of the great mystic, poet and philosopher from the 13th century Persia is still widely read and studied by scholars and common people alike. The simplicity of his poems combined with his accuracy on expressing the true nature of the human soul make him accessible to everyone, making him one of the great masters of global culture. That’s probably why we have dedicated so many articles to him, like his 20 Best Rumi Quotes, among others. Rumi proposes a way of life based on truth and not on the conventions of everyday life which are regarded to be a kind of prison that most people spend their lives in. Love, is a reoccurring topic in his poems, presented as a path to wisdom and a destination at the same time. His concept that everything is a part of a greater whole is a rather modern idea, explored even by scientists nowadays. This concept of Sufi teachings has become a tool for modern societies to understand the link which connects humans and nature to the great power that moves the universe. Don’t hesitate to freely share any image you like on the timeline of your favorite social medium. Portrait-oriented images are better for Google+, Tumblr and Pinterest. The square images fit better on Instagram and the landscape-oriented are perfect for Facebook. Have a great day! Jalāl ad-Dīn Muhammad Rūmī, widely known by the name Rumi, was a renowned Persian poet, Sufi mystic and Islamic scholar born on 30th September 1207 to Mu’mina Khātūn and Bahā ud-Dīn Walad (also affectionately called “Sultan of the Scholars” by Rumi’s students) in either Balkh, a town located in the province of Balkh, which is in present-day Afghanistan or Wakhsh, which is located in present-day Tajikistan. 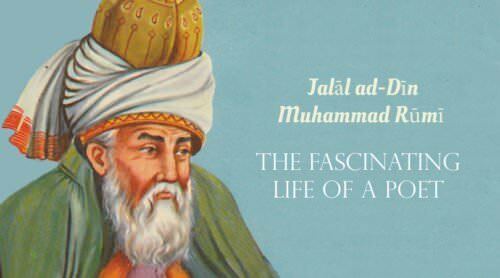 Rumi’s lineage was filled with seasoned Islamic jurists, mystics, and theologians, including his own father Baha’ ud-Din, who was a well known theologian and Hanafi jurist. 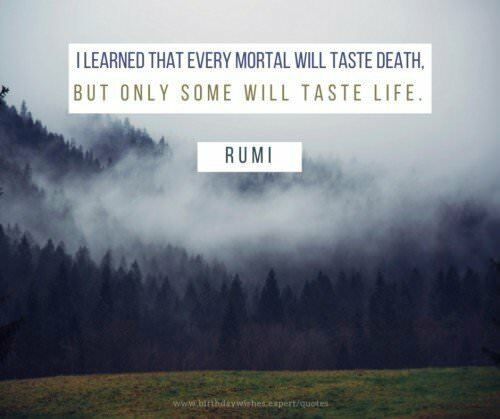 Throughout his life, Rumi was inspired greatly by his father as well as the famous Persian poets Sanai and Attar. Somewhere between 1215 and 1220, to escape the invasion of the Mongols, Baha’ ud-Din safely led his entire family and a group of followers thousands of miles West, passing through a number of famous cities, including Nishapur, Baghdad, Mecca, Damascus and Sivas before finally settling in the city of Karaman, located in the south central part of present-day Turkey – a country in which he not only spent the majority of his adult life but also wrote most of his poetry. 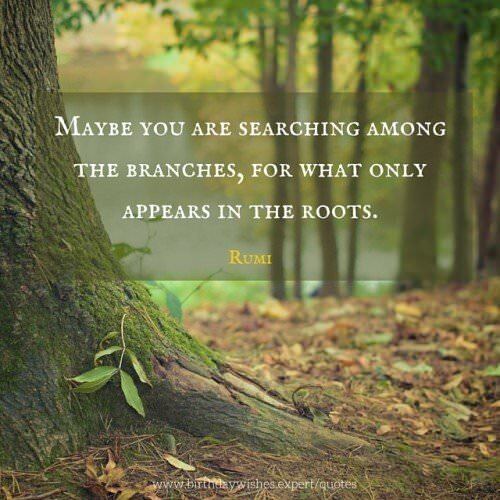 Maybe you are searching among the branches, for what only appears in the roots. Rumi. After spending seven years in Karaman, Rumi and his family later moved to Konya, a city in the Central Anatolia region of Turkey. Some historians believe that the move from Karaman to Konya was inspired by Kayqubad I, the Seljuq Sultan of Rûm, who had on a number of occasions personally invited Rumi’s father to settle down there. In Konya, Baha’ ud-Din was made a teacher and the head of one of the city’s many madrassas (religious school for the study of Islam). Upon his father’s death in 1231, Rumi, who was then 25 years old, took over his father’s position at the madrassa while at the same time learning the Tariqa and the Shariah from a student of his father named Sayyed Burhan ud-Din Muhaqqiq Termazi. For a period of nine years, Rumi was a disciple of Burhan ud-Din until Burhan ud-Din’s death in the early 1240s. It was only after Burhan ud-Din’s passing that Rumi became a prominent Islamic Jurist and began issuing Islamic religious rulings or fatwas and moving from one mosque to another to preach. Ignore those that make you fearful and sad, that degrade you back towards disease and death. 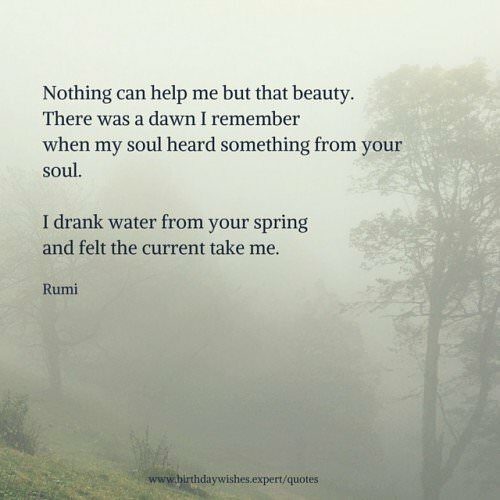 Rumi. Rumi was married twice. His first marriage was to a woman named Gowhar Khatun in 1225. The marriage produced two male children, Baha al-Din Muhammad-i Walad (popularly known as Sultan Walad) and Ala-eddin Chalabi. After the death of Rumi’s wife, he got married again and fathered two more children, a daughter named Malakeh Khatun and a son named Amir Alim Chalabi. By the year 1244 in November, Rumi met a dervish named Shams-e-Tabriz, who became both his very close friend and spiritual instructor. Sham’s presence in Rumi’s life changed him in a very dramatic way. Under the guidance of Shams, he gave up all forms of physical pleasures to become an ascetic. According to some scholars, Shams’ very close relationship with Rumi sprung jealousy among Rumi’s disciples, leading to several of them chasing Shams away from Rumi on a number of occasions until one day Shams mysteriously disappeared and was never seen by Rumi again. Up until today, scholars are not completely certain as to what really happened to Shams. Some say he was murdered by the jealous disciples of Rumi with the assistance of one of Rumi’s own sons, whereas others believe he was driven away and decided never to come back. 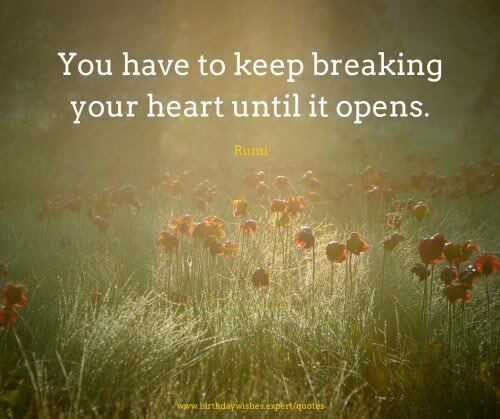 You have to keep breaking your heart until it opens. Rumi. The disappearance of Shams had such a devastating effect on Rumi that he temporarily abandoned the madrassah and traveled far searching for his beloved friend. He reportedly even went as far as Damascus searching for him to no avail and was forced to return home accepting the sad fact that he would never see Shams again. The breeze at dawn has secrets to tell you. Don’t go back to sleep. Rumi. 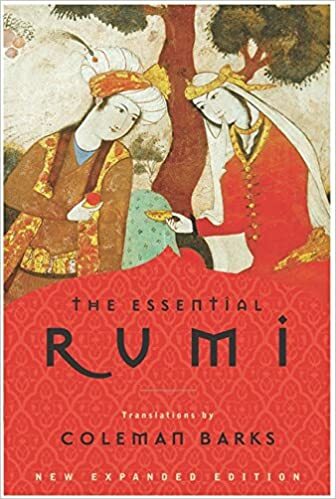 The loss of his dear friend inspired Rumi to write one of his most famous masterpieces titled Diwan-i Shams-i Tabrīzī (also know in English as The Works of Shams of Tabriz), which is a brilliant collection of lyric poems mostly in the new Persian language containing over 40,000 verses. Today, Divan-e-Sham-Tabriz is widely regarded as one of the most influential works in the entire history of Persian Literature. After the disappearance and possibly death of Shams, Rumi was again inspired by another friend named Hussam-e-Chalabi, who mentioned that if Rumi could write a book like the Illahinam, lots of traveling musicians popularly known as troubadors would like it. This encounter led to the birth of yet another major poetic work of Rumi entitled Masnavi (also known as Masnavi-I Ma’navi). The Masnavi, which is a series of six books (volumes) of poetry, is considered by many as one of the greatest works of Sufism (Tasawwuf). Each book of the Masnavi is made up of roughly 4,000 verses and comes with both a prose introduction as well as an excellent prologue. When you feel a peaceful joy, that’s when you are near truth. Rumi. Away from these famous works, Rumi’s other notable works include Fihi Ma Fihi (It Is What It Is), Makatib (The Letters) and Majāles-e Sab’a (Seven Sessions). Let silence take you to the core of life. Rumi. In the year 1273, precisely on December 17th, Rumi passed away after a brief sickness and he was buried beside his father. The site of his burial which is located in Konya, Turkey is known as the Green Tomb (the Mevlana Museum). Today, thousands of people from all over the world visit Rumi’s mausoleum every month to honor him. I want this music and this dawn and the warmth of your cheek against mine. 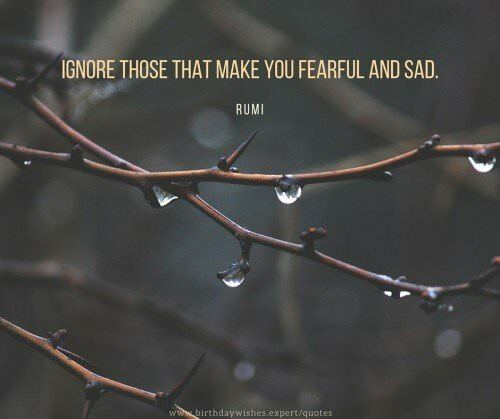 Rumi. Following his demise, most of his major works were taught and made famous in the West by the renowned American scholar Shahram Shiva. 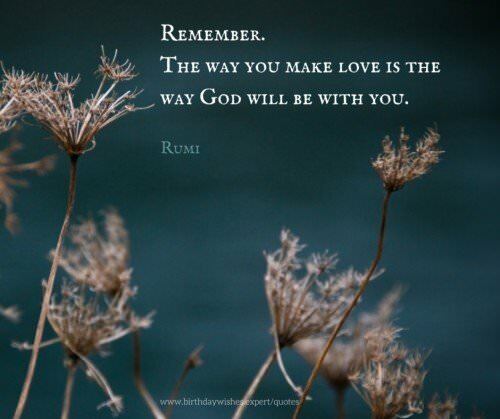 Today, in the western world, Rumi’s teachings are much accepted as a foundation to the beliefs of Sufism. Despite his death several centuries ago, today Rumi is one of the most widely read poets in many parts of the world, including in the United States, where he is considered the bestselling poet in the country. His poems have also served as a foundation for classical music from a number of countries and have even appeared on top of the U.S. music charts on a number of occasions. In addition to being translated from Persian language into numerous other languages such as English, German, French, Arabic, Russian, Spanish and Italian, Rumi’s literary works have significantly influenced numerous scholars such as the award-winning performance poet and author Shahram Shiva and the legendary British Indian poet Sir Muhammad Iqbal. 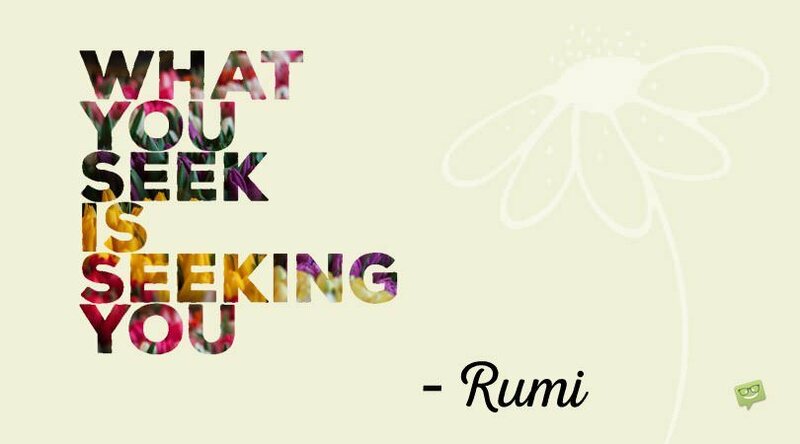 Till date, Rumi is widely considered as one of the most influential poets of all time. 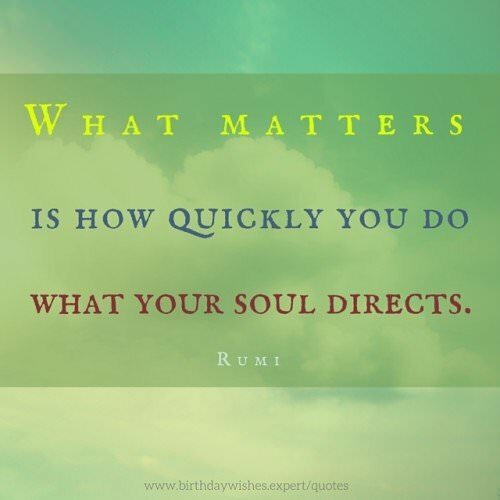 What matters is how quickly you do what your soul directs. 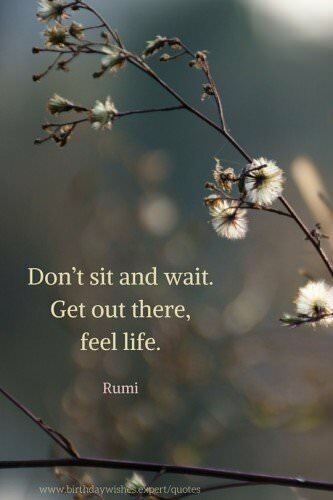 Rumi. Remember. The way you make love is the way God will be with you. What matters is how quickly you do what your soul directs. I know you’re tired but come, this is the way. Two there are who are never satisfied — the lover of the world and the lover of knowledge. The breeze at dawn has secrets to tell you. Don’t go back to sleep. 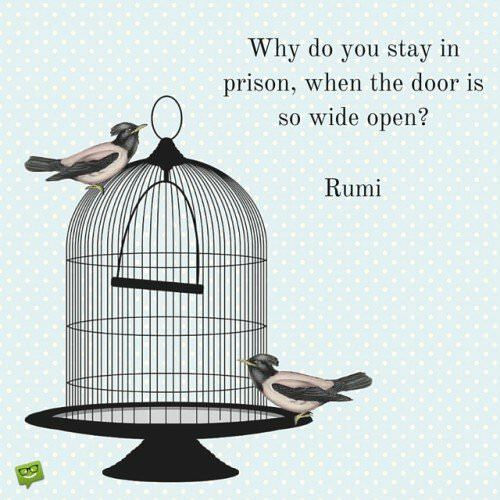 Why do you stay in prison, when the door is so wide open? 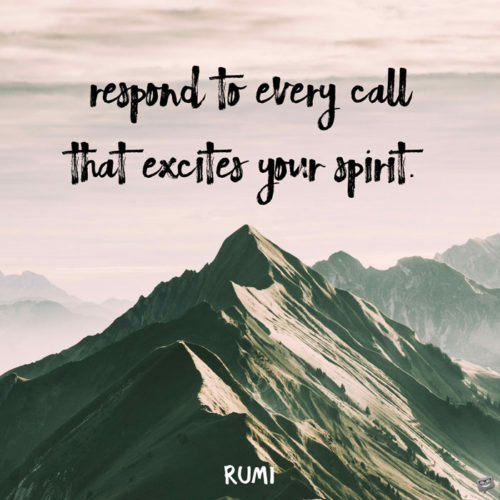 Rumi. Not only the thirsty seek the water, the water as well seeks the thirsty. I once had a thousand desires. But in my one desire to know you all else melted away. Give your weakness to one who helps. At the end of my life, with just one breath left, if you come, I’ll sit up and sing. Whoever’s calm and sensible is insane! I am yours. Don’t give myself back to me. You think because you understand ‘one’ you must also understand ‘two’, because one and one make two. 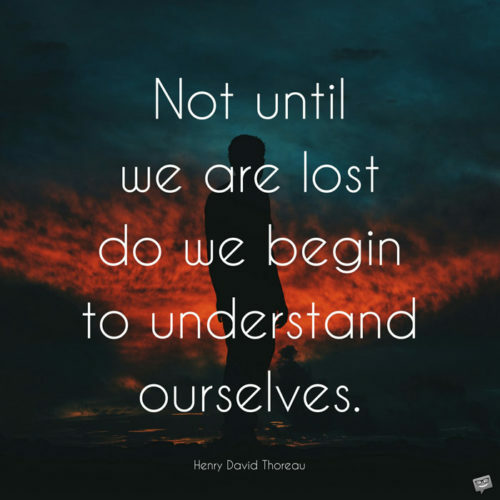 But you must also understand ‘and’. There are lovers content with longing. I’m not one of them. Is it really so that the one I love is everywhere? 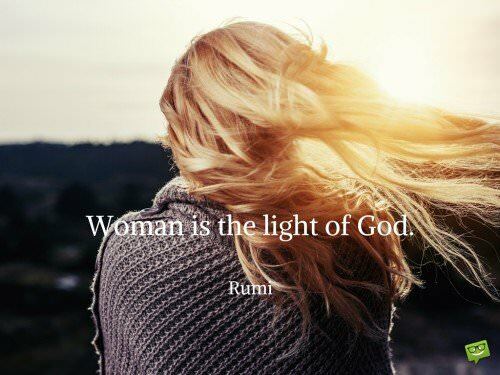 Woman is the light of God. 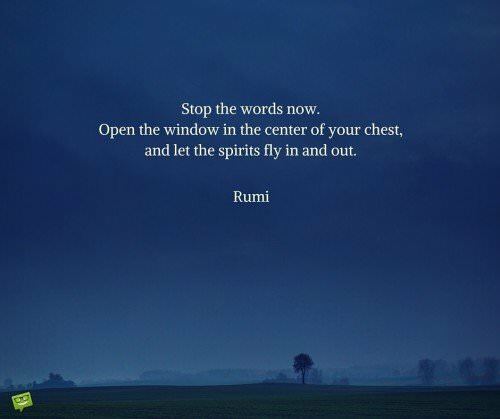 Rumi. 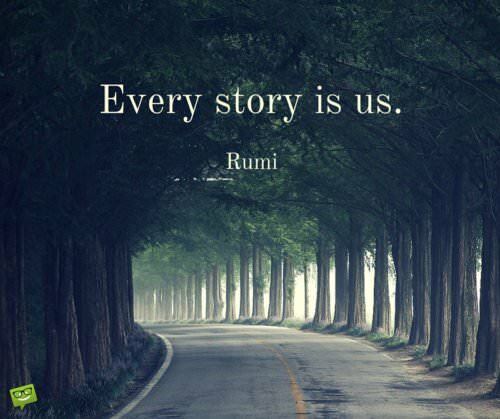 Every story is us. 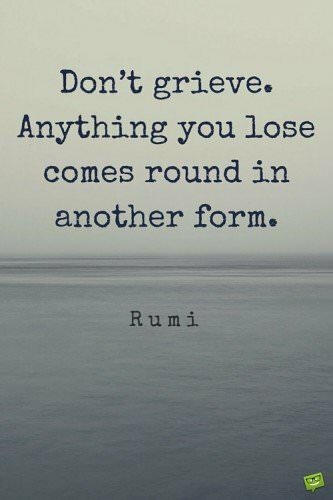 Rumi. A mountain keeps an echo deep inside. That’s how I hold your voice. Let the lover be disgraceful, crazy, absentminded. Someone sober will worry about things going badly. Let the lover be. I was dead, then alive. Weeping, then laughing. The power of love came into me,and I became fierce like a lion,then tender like the evening star. Rumi. In the house of lovers, the music never stops, the walls are made of songs & the floor dances. Soul, if you want to learn secrets, your heart must forget about shame and dignity. You are God’s lover, yet you worry what people are saying. Rumi. until your eyes constantly exhale love as effortlessly as your body yields its scent. Stop the words now. Open the window in the center of your chest, and let the spirits fly in and out. Rumi. Come, come, whoever you are. Wanderer, worshiper, lover of leaving. It doesn’t matter. Ours is not a caravan of despair. come, even if you have broken your vows a thousand times. Come, yet again , come , come. People want you to be happy. Don’t keep serving them your pain! would fly up like doves. Don’t grieve. Anything you lose comes round in another form. 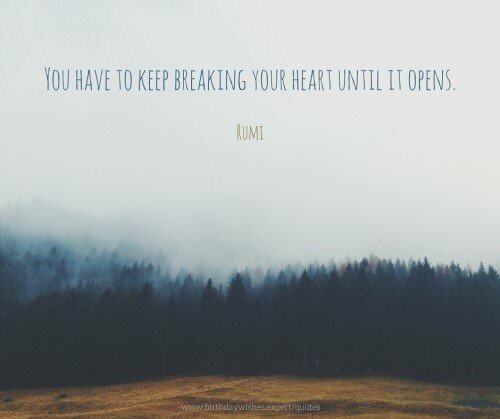 Rumi. I too have been covered with thorns. I will be waiting here…. 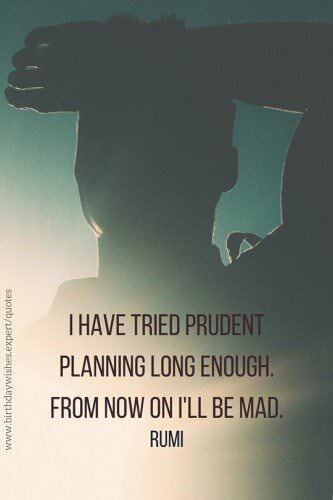 I have tried prudent planning long enough. From now on I’ll be mad. 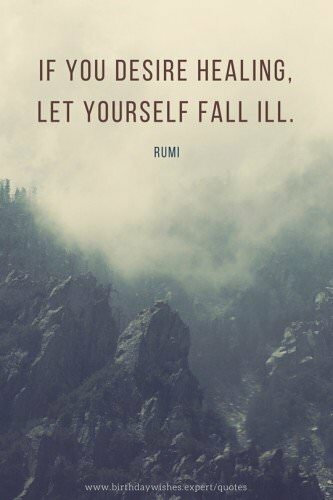 Rumi. Let yourself be drawn by the stronger pull of that which you truly love. It will not lead you astray. Run from what’s comfortable. Forget safety. Live where you fear to live. Destroy your reputation. Be notorious. I have tried prudent planning long enough. From now on I’ll be mad. 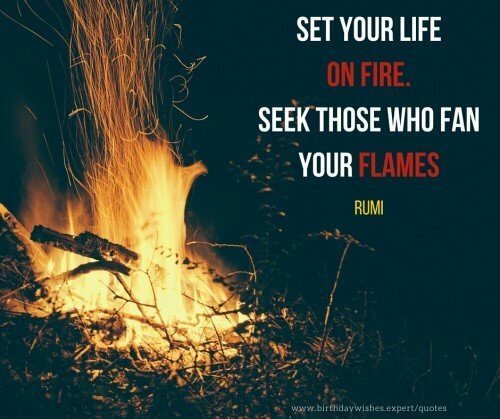 Set your life on fire. Seek those who fan your flames. 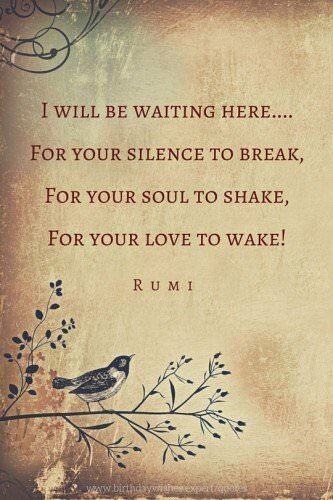 Rumi. or the gold. Look at the giver. these are not true distinctions. Seek treasures amid ruins, sincere one. All people on the planet are children, except for a very few. No one is grown up except those free of desire. Give up to grace. The ocean takes care of each wave ’til it gets to shore. You need more help than you know. Have you seen our Quotes about Education? You are a lover of your own experience … not of me … you turn to me to feel ur own emotion. The ground’s generosity takes in our compost and grows beauty! Try to be more like the ground. Learn the alchemy true human beings know. The moment you accept what troubles you’ve been given the door with open. If in the darkness of ignorance, you don’t recognize a person’s true nature, look to see whom he has chosen for his leader. Do not feel lonely, the entire universe is inside you. 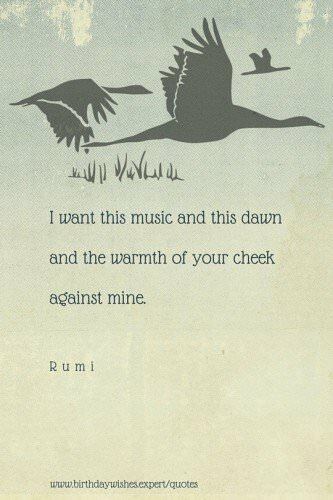 Rumi. There is a secret medicine given only to those who hurt so hard they can’t hope. and try to see a treasure in everyone. Don’t sit and wait. Get out there, feel life. Rumi. Don’t be satisfied with stories, how things have gone with others. 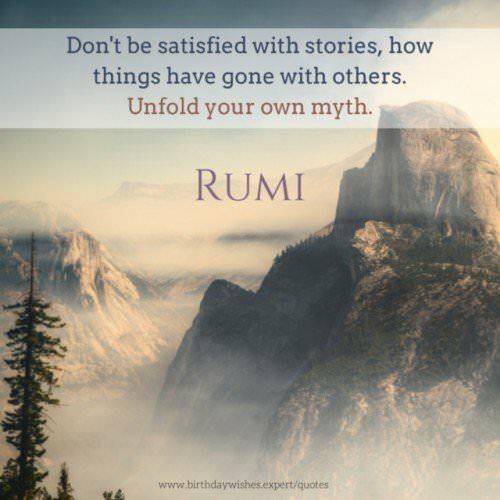 Unfold your own myth. 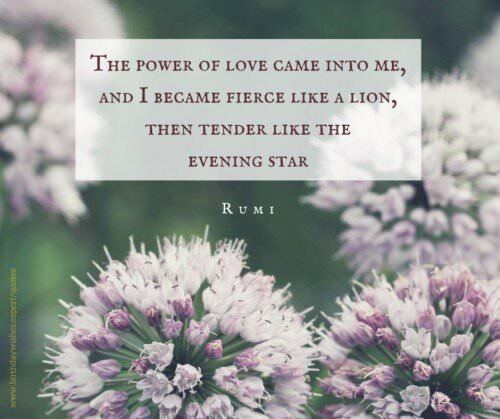 Rumi. 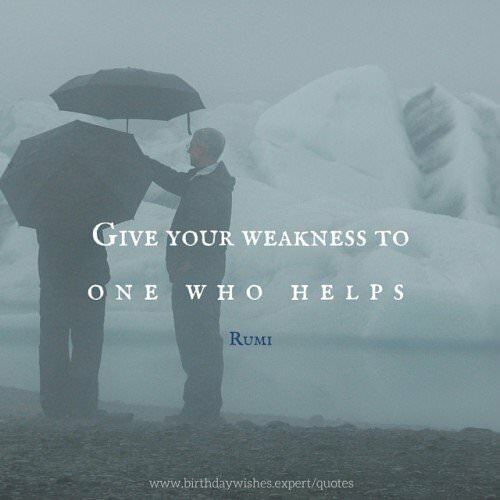 Give your weakness to one who helps. 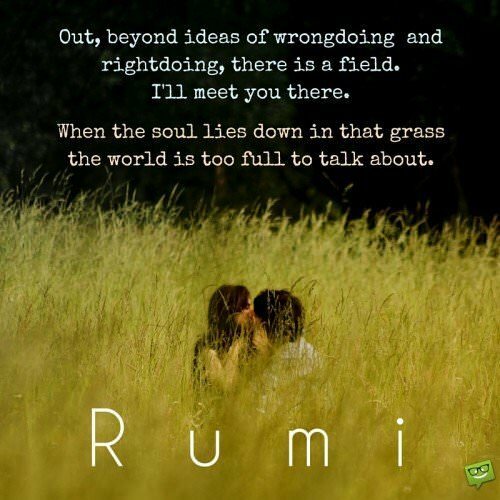 Rumi. You have no idea how hard I’ve looked for a gift to bring You. Nothing seemed right. What’s the point of bringing gold to the gold mine, or water to the ocean. Everything I came up with was like taking spices to the Orient. It’s no good giving my heart and my soul because you already have these. So I’ve brought you a mirror. Look at yourself and remember me. I learned that every mortal will taste death, but only some will taste life. 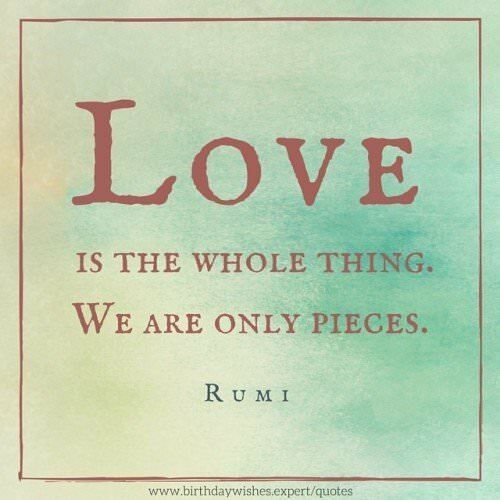 Rumi. What can I do, Muslims? I do not know myself. not of the earth, not of water, not of air, not of fire. not from existence, not from being. not from the realm of the two Iraqs, not from the land of Khurasan. I am not from Adam, not from Eve, not from paradise and not from Ridwan. He is the first, he is the last, he is the outer, he is the inner. Beyond He and He is I know no other. I am drunk from the cup of love, the two worlds have escaped me. I have no concern but carouse and rapture. from that hour and that time I would repent my life. I will trample the two worlds underfoot and dance forever. I have no tale to tell but tipsiness and rapture. You may freely download, reuse, share or modify these photos for non-commercial purposes (CC BY-NC 4.0). 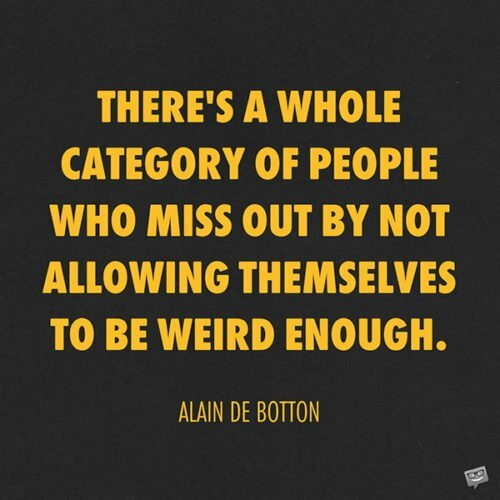 We would appreciate an attribution. 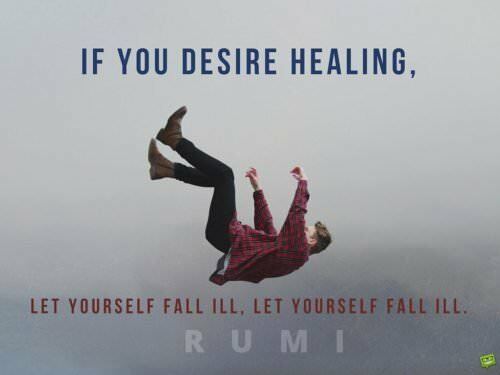 If you desire healing, let yourself fall ill. Rumi. In Silence there is eloquence. 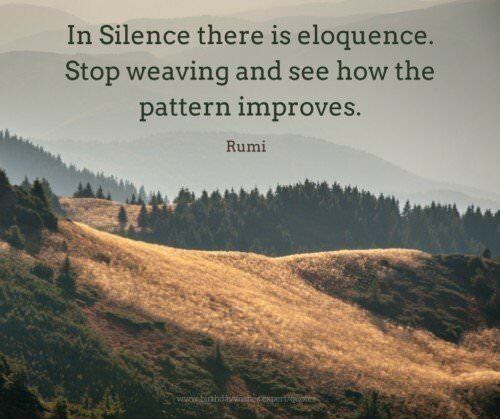 Stop weaving and see how the pattern improves. Rumi. Is it really so that the one I love is everywhere? Rumi. Let yourself be drawn by the stronger pull of that which you truly love. Rumi. Love is the whole thing. We are only pieces. Rumi. 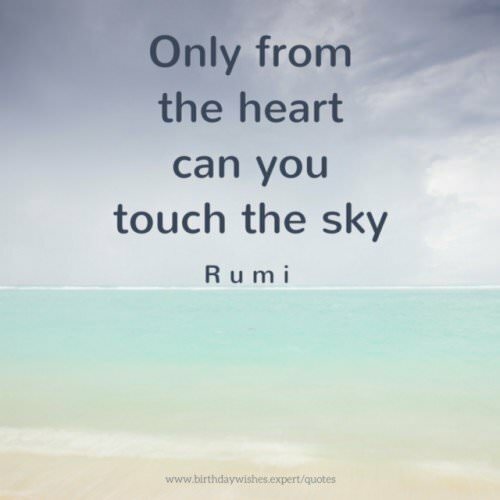 Only from the heart can you touch the sky. Rumi. People want you to be happy. Don’t keep serving them your pain! If you could untie your wings and free your soul of jealousy, you and everyone around you would fly up like doves. Rumi. Remember. The way you make love is the way God will be with you. Rumi. 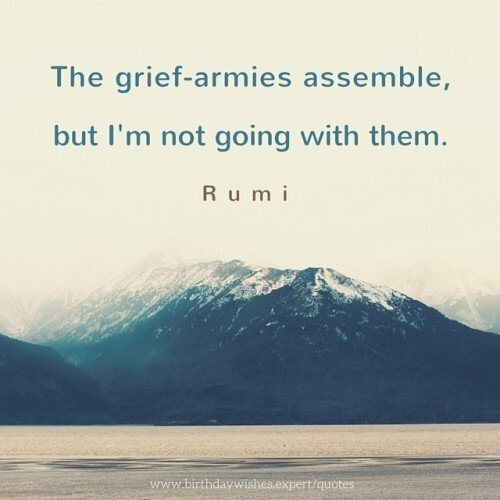 The grief-armies assemble, but I’m not going with them. Rumi. The power of love came into me, and I became fierce like a lion, then tender like the evening star. Rumi. 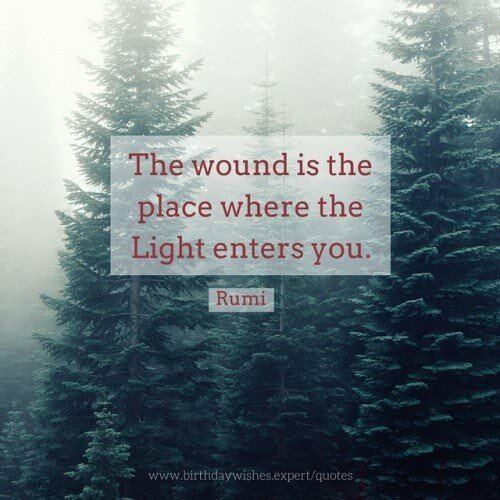 The wound is the place where the Light enters you. Rumi. 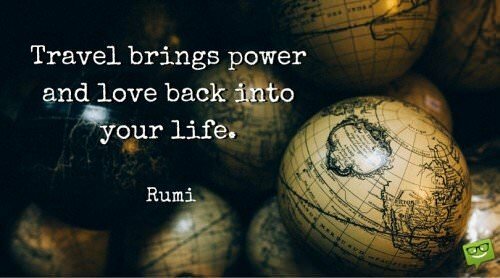 Travel brings power and love back into your life. 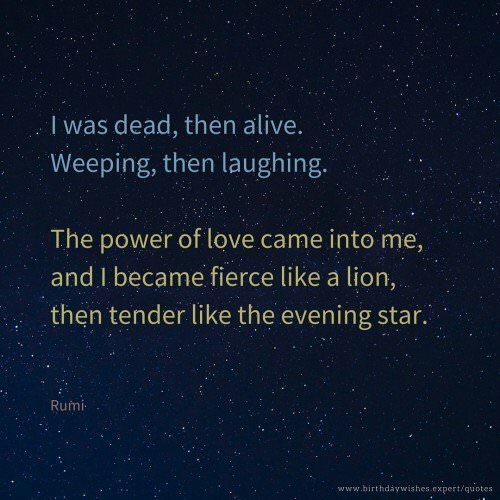 Rumi.